Greg Ignoffo is an experienced personal injury litigation and trial attorney who has devoted his career to representing people harmed by others. He has successfully represented clients in wrongful death and personal injury cases in the areas of medical negligence, nursing home abuse and neglect, product liability, work injuries, and automobile collisions. His efforts have secured many millions of dollars in recovery for clients throughout Illinois and beyond, including Indiana, Wisconsin, Michigan, California and Florida. Greg’s many successes have been recognized by Illinois Super Lawyers® magazine which has repeatedly (2009-2019) named him as an Illinois Rising Star – a distinction given to only 2.5% of Illinois lawyers under the age of 40. He has also earned a Martindale-Hubbell® “AV” rating indicating that his peers recognize him to be of the highest legal ability with adherence to the utmost in ethical standards. Having successfully tried numerous personal injury and wrongful death cases to verdict, Greg has earned a reputation among the defense bar and insurance industry that he will always fight for his clients. A testament to his trial skills, on multiple occasions defendants have settled cases with Greg days after beginning a trial despite a prior refusal to do so. Greg is also highly adept at the mediation process, routinely negotiating substantial pre-trial settlements for his clients. His success is driven by thorough preparation, exceptional attention to detail, absolute command of the issues, and a sincere compassion for those he represents. In addition to his busy practice Greg has served, along with John Kelly, as volunteer counsel through Catholic Charities of Chicago providing pro bono services to those most in need. Greg has also been a presenter at continuing legal education seminars and is a member of the Illinois Trial Lawyers Association, among other professional legal organizations. 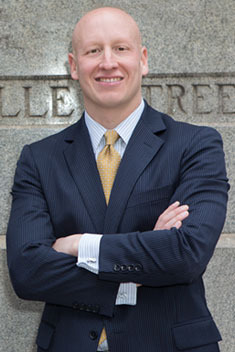 Greg earned his law degree from John Marshall Law School in 2004 and earned his undergraduate degree with Distinction from Dominican University in River Forest, Illinois. He regularly returns to his alma maters, as well as his high school in the western suburbs, to speak with students about his work. When away from the office, Greg enjoys spending time with his wife, who is also a Chicago area attorney, and their three young children. Greg also remains committed to being involved in the west suburban community where his family lives.